Leading Service Provider of missed call number from New Delhi. We are enlisted amongst the leading names in the industry, offering reliable and well-furnished Missed Call Number. The offered service is unique service to get leads from the client. This service is 24x7 activated so customer if calls at late night or early morning you will never missed them. With the increase number of online frauds, verification of mobile number is an essential task to curb such menace; our misscall service has developed an innovative solution for all such needs. Our skilled professionals closely co-ordinate with the clients and offers this service as their specifications. 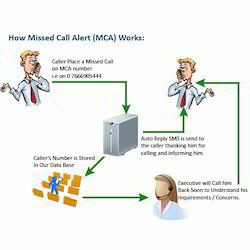 Miss calls service is unique service to get leads from the client.The missed call number is 24x7 activated so customer if calls at late night or early morning you will never missed them.We are in this field from last 7 years and our customer have achieved susbstantial savings with this.We give you a dedicated number whenever customer calls on this number,you can see the number on our control panel. With the increase number of online frauds, verification of mobile number is an essential task to curb such menace; our misscall service has developed an innovative solution for all such needs. All you need is just a small piece of code to be pasted in your web page. Gone are the days when you need to stand in queue to vote for your candidate. Sending SMS for a voting campaign is also considered to be old concept welcome to the new world of voting through missed call on unique toll-free number. Going one step further, our miss call service has developed a unique platform through which your valuable customers can now send their feed-back, ratings etc. through missed call. This cost effective solution is widely accepted for easy participation and its free for end user. Affordable price, Offering one of the lowest rated solution, choose the plan that best fits your needs. User friendly interface, Easy to use, user friendly interface along with dashboard, operator & circle wise report along with Geo location tracking. No software knowledge or training is required to use our miss call service.